Newsletter 8 – CONTEC M2M/IoT Controller “CONPROSYS™” – Takebishi Europe B.V. The new CONPROSYS M2M Controller products are intelligent IoT devices containing firmware with various integrated communication functions. By just connecting the M2M controller with devices that you would like to monitor, the collected data will be sent to the CONPROSYS cloud service, and you can monitor them via the internet. The M2M controllers are equipped with a Modbus/TCP slave response function and can be accessed by supporting Modbus/TCP controllers, such as PLC (Programmable Logic Controller). 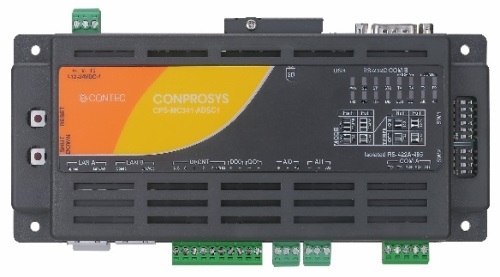 The new units can connect seamlessly to a controller like PLC with SCADA (Supervisory Control And Data Acquisition) installed, with OPC server provided by Contec. They can also work as a remote I/O unit in an on-site M2M communication control system. Easily control a commercial air conditioning via PC and tablet from a remote location using a combination of the CONPROSYS devices and cloud services. When an abnormal issue occurs, the system will automatically send an alert message by e-mail. A combination of the CONPROSYS devices and cloud services gathers information on operation and environment status. This periodic data gathering can be used for environment control and for planning improvement projects. For more information, please contact Takebishi Europe by e-mail or call us on +31-20-705-5150.